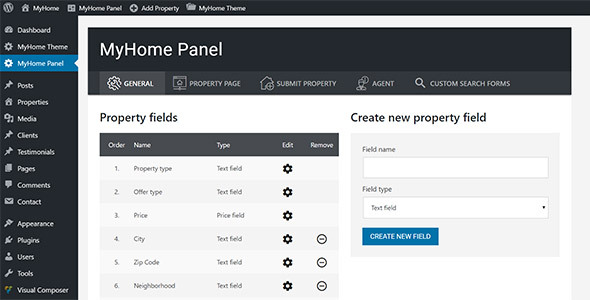 MyHome is a premium Real Estate WordPress theme that you can use to create amazing and intuitive Real Estate websites your customers will love to use. Flexible and innovative, MyHome requires no prior coding knowledge, making it easy for you to build sleek, user-friendly websites. 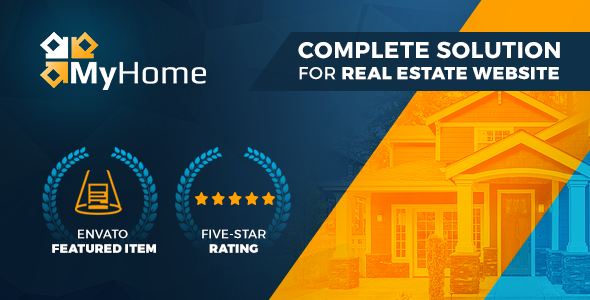 We’ve spent thousands of hours mastering the core functions; whether you’re building a website for a single agent or a full agency, MyHome has everything you need to run a successful Real Estate business. We’re so confident you’ll love our theme that we’ll give you a 14-day trial absolutely free. Single Click Import – With access to six tailored demos, 14 homepages and a wide range of ready-to-use pre-set pages, building your website is easy. MyHome includes a varied library of images and video that are available for your use at no extra cost. Globally Adaptable – Translate text into any language, change currencies and switch between the imperial and metric system. MyHome is RTL and WPML ready. Free partial translation files for some of the languages: español, français, हिन्दी (hindī), polski, italiano, Deutsch, български. Intuitive Page Builder – Build pages with our handy drag and drop system. MyHome has 18 more drag and drop modules than WPBakery Page Builder, one of the leading WordPress plugins on the market. Each module is specially designed to work with MyHome and is not available anywhere else. Custom Fields – Every Real Estate business is different, and MyHome ensures that you’re never stuck with default settings. Create an unlimited number of custom search fields to make sure that your search engine meets your clients’ needs. 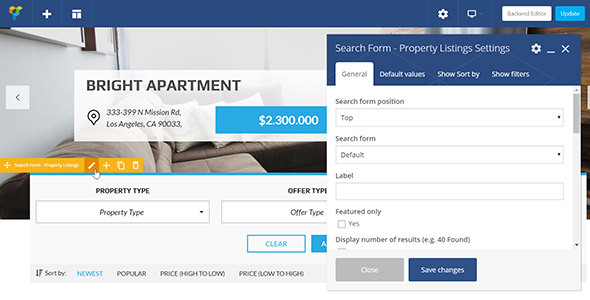 Advanced Search Functionality – Search forms are critical in the Real Estate business, so we’ve spent hundreds of hours testing and improving the MyHome search function. The result? A robust and flexible search engine that can be customized to fit your customers’ needs, allowing them to search for properties based on their specific criteria. Instant Results – Search results are updated as you type, providing you with potential options and saving your visitor the hassle of multiple search entries. Retain users and minimize your bounce rate by providing a user experience they can’t find anywhere else. Map Searches – Add Google Maps to your website with additional filtering capabilities. It is fully dynamic and integrated with Google Street View. Classic Searches – Create a classic search form that redirects visitors to the dedicated page with a list of all your available properties. Save some space on your homepage and display any other information you want clients to see about you, your company, testimonials or special offers. Relevant Fields – Advanced search engines naturally provide a lot of option fields. Our smart search engine cuts out the excess based on property type selection, so your visitors only need to fill in sections that are relevant to their requirements. Field Relationships – Need to connect your City field to your Street field? Create an unlimited number of relationships between search fields to automatically filter your search options and create a faster, more user-friendly experience. Keyword Autocomplete – MyHome automatically provides suggestions to your users as soon as they start typing in any search box to help them find what they need, fast. Saved Searches – No one has the time to trawl through search results every day. Saved searches trigger an email notification whenever properties that match your customers’ criteria appear on your MyHome website. Sliders – Fully integrated property sliders give you the opportunity to feature your most spectacular properties on any page. Highlight properties that deserve a little more love from your customers. Additionally eight MyHome-exclusive intro sliders. You’ll also have access to 80+ free sliders from the official Revolution Slider library. Flexible Property Page – Use galleries or full-width sliders to make your property page look amazing. Change the order of the single property sections, customize your sidebar and contact forms. Disable modules you’re not using with a single click. Our powerful pricing module allows you to assign multiple price points to one property at the same time, such as price ranges, or rental vs sale. Property Videos – A picture is worth a thousand words, and video gives you the best of both worlds! Include links to YouTube, Vimeo, Facebook or upload a .mp4 file to generate responsive video automatically. Property Virtual Tour – Include an iFrame or embed code to display a Virtual Tour from any tour provider. Property Attachments – Upload any additional files that your clients may need, such as Word documents, PDFs or image files. Property Plans – Upload property plans and display them in the image accordion to save space on your property pages for other information. Sticky Sidebar – Make your contact form and user profile more visible by sticking it to one side of the screen so that your users can easily contact you as soon as they see a property that piques their interest. 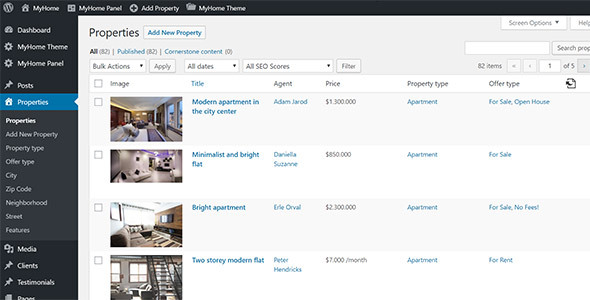 Related Properties – Display related properties on each property page based on any text field criteria that you choose, such as offer or property type. Nearby Properties – Add a map to your property pages that show other properties in the neighborhood. Choose the size of the search radius in your admin panel to maximize page clicks and increase the number of leads. Favorite Properties – Enable users to add any property to a list of favorite properties so that they can easily find them at a later date. A favorites option encourages users to register with your site, increasing the chances of a sale and increasing the value of your website. Compare Properties – Users can compare an unlimited number of properties simultaneously. Differences between property fields, location and price will be visible at a glance, relieving users of the frustration of hopping between browser windows to compare potential purchases. Icon Integration – Text is simple, but it can take up a lot of space on your page. Use icons on your property cards or page to denote the number of beds and bathrooms, save space, and streamline the browsing experience. MyHome provides a unique collection of integrated Real Estate icons and fonts for your use. Comment Support – User engagement and customer support are vital aspects of any online experience. Allow comments on the property page to find out what users want to tell you. Breadcrumbs – Improve your website flow and make it easier for customers to browse your site for longer. Breadcrumbs make your pathways more visible and enable your customers to jump back to their original search criteria without having to re-enter their search parameters. User Roles – From Agents to Buyers, your users need different levels of access to perform different tasks. Set up and customize user roles according to your company structure – the level of access is up to you. User roles included: Agent, Agency, Buyer and Super Agent. Social Authentication – Allow users to create an account through their existing social media, turning a time-consuming chore into a quick and easy process. Facebook, Gmail, Twitter and LinkedIn integration are available. Captcha – As bots and AI become more and more advanced, it’s more important than ever to protect your website from spam and scammers. Google reCAPTCHA prevents spam content from getting through, protecting your customers and your brand. Email Notifications – Get updates on your website without having to log in; email notifications will alert you when a new customer registers on your site, or when a third party submits a property for moderation. User Moderation – Keep full control of your website by monitoring new users and approving usage permissions. By requiring manual approval for all fully-fledged agents, you can prevent untrained staff from making unapproved changes and avoid any disasters. Custom User Fields – Add new fields according to user requirements. New fields will automatically appear in all user profiles and on all user cards and carousels. Terms of Service – This checkbox requires users to accept your terms of service prior to registration, making you compliant with GDPR and any other data regulations. Flexible Property Submission Form – Change the order of the fields on the property submission form. Add required fields, instructions, set the maximum number and size of images in the gallery, and create multiple and single choice fields. Property Moderation – Can unknown third parties add properties to your website? MyHome’s moderation function enables you to approve or reject these entries before they go live, giving you full control. Step-by-Step Submission Process – Customize your property submission process and split large forms into smaller, easy-to-digest pieces. Long and overly complicated processes scare away new users; simple forms are an easy way to improve your conversion rate and retain customers. Pre-Registration Property Submission – Enabling new customers to fill in the property submission form before they register makes it more likely that they will complete the registration process. Nobody likes to leave a job half-finished or feel like they’ve wasted time; registration after property submission encourages potential new customers to stick around. Add Addresses Via Map – When choose a location on your submit property form, certain property fields will be auto-fill based on Google Maps, saving you or your customers the hassle of looking up zip codes and street names. Monetize Your Website – Memberships and packages enable you to turn your website into a source of revenue. Payment Methods – Offer your clients a wide variety of payment methods. MyHome’s integration with WooCommerce Payment Gateways opens the door to a number of ways to pay. PayPal/Stripe/Direct Bank Transfer integrated. Payment Packages – With flexible payment packages, you can create customized offers for your clients that will meet their various needs. You can add discounts, coupons, or even create one-time only offers. For brand-new websites, set the number of free properties that a user can add before they switch onto a paid plan, enabling you to build trust with new clients in the early days of your business. Expiry Dates – Old property listings clog up bandwidth and mislead property buyers. Set an expiry date to ensure that old property listings are cleared out of your archives to make space for new ones. Design Options – Your website is part of your brand. With access to more than 150 color pickers, 800 Google fonts and more than 10,000 Google Map color pallet styles, customize your site to fit your brand and make it instantly recognizable to your customer base. Menu Options – Upload logos, edit menus and drop-downs, customize header bars and much more. Search Engine Optimization (SEO) – SEO is a must for any WordPress theme, but we’ve taken it one step further. MyHome helps Google understand your content with optimized headings and archive pages that create additional unique pages for your website automatically. MyHome also fully supports the Yoast plugin to give your SEO rankings that extra boost. Blog Options – Create stylish blog pages with no extra plugins. Everything you need to start blogging is already integrated into MyHome. Social Button integration – MyHome includes the Premium Easy Social Share Button plugin at no extra cost. This plugin is used on more than 300,000 websites, has more than 40 button styles and incorporates more than 40 of the most popular social networks, including Facebook, Twitter, Pinterest, LinkedIn, Google+ and many more. Bundled Plugins – We believe that more is more. That’s why we’ve included Revolution Slider, WPBakery Page Builder (Visual Composer) and Ultimate Addons, Easy Social Share Buttons, and Advanced Custom Fields PRO as part of our package. You can read more about Bundled Plugins here. 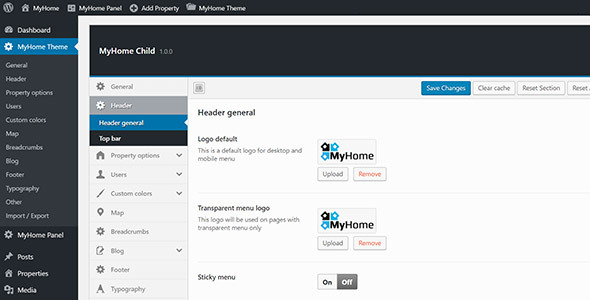 Supported Plugins – MyHome is high-quality code that integrates smoothly with most popular plugins. We fully support Yoast, W3 Total Cache, WPML and Contact Form 7. Lifetime Free Updates – Exactly what it says on the tin; even if your support service has expired, you will still receive updates to your MyHome theme free of charge. IDX Broker Integrations – This integration is completely optional. It is limited to licensed agents from the United States, Canada, Bahamas, Mexico and Jamaica. Please click here for more detail. Top Class Support – Contact us via support@tangibledesign.net if you have any questions, problems or feedback. Our highly-trained team of developers will provide you with the information you need.